Although, the majority of machines that we manufacture are fixed chamber incinerators. 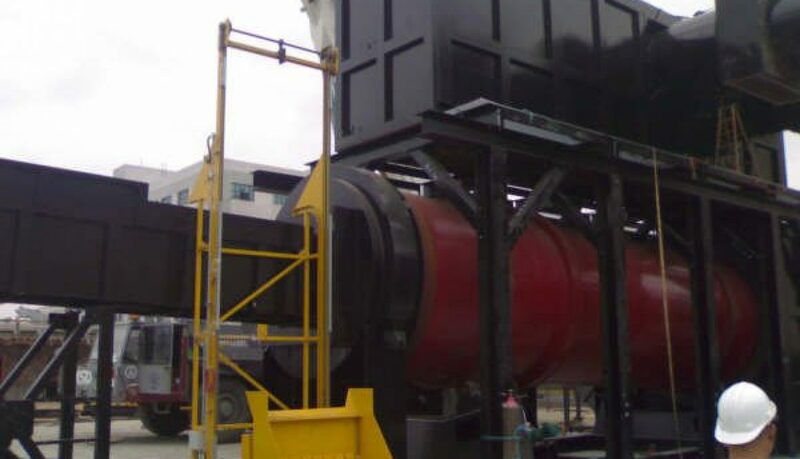 There are occasions when considering a Rotary incinerator could be the right decision for you and your waste requirements. As every need is unique we would always recommend that if you have any questions that you let us help guide you to the best solution for you. The main different in Rotary kiln incinerators consists of their cylindrical primary chamber that rotates or indexes on a set of motorised gears. As the waste load enters the kiln, rotation of this chamber provides agitation to the waste stream. This movement provides a turbulent environment, this then exposes un-combusted material that may have otherwise sat in the middle or the bottom of a load during the combustion process. 1) The diameter, length and pitch of the primary chamber is of an adequate size/angle to provide a high-quality ash in which total organic components present in the ash less than <3% or <5% (depending on the waste type), by the time it reaches the ash drop out zone. 2) The sizing of the primary chamber is synchronised to the amount of revolution a primary chamber may undertake. A particularly low moisture, low calorific waste load will required more revolutions to ensure heat penetrates through the load, however more revolutions will mean the waste may travel faster than anticipated. 3) The correct diameter of the kiln can be governed by many factors, including burn rate and waste type. The volume of the chamber has to be consistent with the waste density loaded. 500kg of loose animal by-products may only take up 1m3 whereas 500kg of Municipal Solid Waste may take up 5m3 of space. As such it is vitally important that each and every rotary incinerator, is correctly designed and modelled prior to its construction. Where possible computational fluid dynamic (CFD) modelling, should be employed to confirm waste retention times in the primary chamber. Rotary Kilns consist of the same major components of similar sized incinerators with only the primary chamber, inlet and outlet vestibules being considerably different. The primary chamber construction is typically cylindrical steel structure, with a refractory installation consisting in the majority of a high-grade refractory brick refractory. Orientation of burners and secondary chamber outlets can be specified as ‘co-counter flows’ or as ‘counter current flow’. As leading manufacturers in incinerators we are able to utilise our 35 years of experience into providing the right solution to your needs. Able to manage every aspect of the design and build in-house, where our sales and design engineers will develop the incinerator along your exact requirements through to our expert, welder fabricators, electricians and refractory masons ensuring that your incinerator is built to our exacting standards to deliver the results to safely dispose of your waste. View our Rotary Incinerators by clicking here.